This quiet little spot in the middle of the marshland peninsula has a church which is far more interesting than at first it might appear. The compact graveyard is pretty full, a testimony to how busy this area was in the 18th and 19th century. 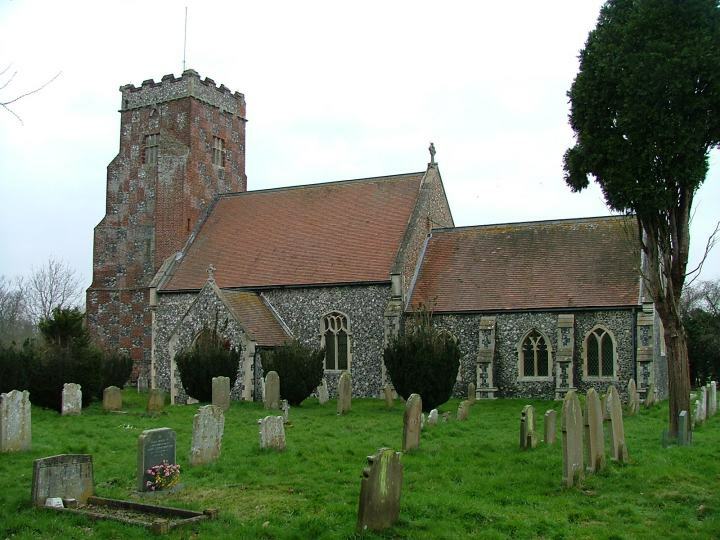 The tower is a chequerboard of flint and brick, typical of the Tudors, and relatively unusual in Norfolk, although the same thing seems to have been begun at neighbouring Burgh. Burgh was never finished, but this one was, probably on the very eve of the Reformation. However, not everything planned here reached completion, as we shall see inside. At first sight, the interior is entirely Victorianised, but this is not at all the case. For a start, although the colouring on the font has been renewed, it appears to match what is on the shaft. And the whole piece is not vandalised at all. This may simply be because, judging from its style, it was produced almost immediately before the Reformation. It has the little heads familiar from other fonts in this area, nearby Aldeby for example, but here they have become angels, and the panels are heraldic in style - it takes a second glance to see that one of the panels depicts the Instruments of the Passion, and another a Holy Trinity symbol facing the wall. The font has certainly been moved by the Victorians, so perhaps the instruments were previously less visible. The screen appears Victorian, but if you look closely you can see that the lace-like tracery is late 15th century. And then, look up. There is a vast chancel arch, but it is partly filled, and beneath it is a small arch into the current chancel, and an even smaller one into the north chancel aisle. what happened here? It appears that the nave was widened by moving the north wall outwards, and the great arch built in preparation for refashioning the chancel and aisle into a new, wider chancel. The south chancel aisle had already been demolished - witness the filled in arcade on the south wall of the chancel. But the new chancel never happened; the Reformation intervened. Between the chancel and the aisle is a simple little tombchest, probably designed to act as an Easter Sepulchre. It is anonymous, but the Holy Trinity symbol held by an angel matches the one on the font which I believe to be contemporary with the tower, so what we have here may well be the tomb of the donor of the new church. Intriguingly, as DD pointed out, an angel on the other side holds a blank shield - was a set of Instruments of the Passion intended for it? The survival of the font imagery might be explained by the brass to John London, who died in 1620 a strong Laudian, if his inscription is anything to go by. Unusually in this area, the Londons supported the Crown in the Civil War. I loved the art nouveau font cover, a tree carved intricately in wood, rather like that in the window of St John the Baptist at nearby Haddiscoe. There is more of this carving up in the chancel, and it is extraordinary. Worth a visit on its own.